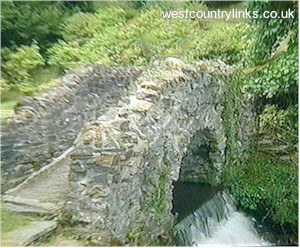 Exford Hotels Cottages Caravan Parks Campsites Devon. Exford of the highland villages is the largest. It has cheerful pubs, a nice green and a modest little church with a remarkable fine 15th century screen. The stone bridge in the centre of the village is now used instead of the ancient ford that gave the place its name. Exford is a noted centre for stag hunting and fishing, and a horse show is usually held on the second Wednesday in August. A footpath, about five miles long, leads north to Exford common and so to Dunkery Beacon, the highest point of Exmoor (1705 feet).